Thank you for showing an interest in our product. All of us affiliated with Bitterroot Evergreens appreciate knowing that people from all over the world have had an opportunity to share the experience of fresh, “Made in Montana” holiday decorations. 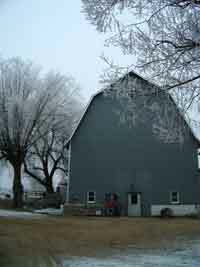 Our business is now located in a historic dairy barn that was built in 1909. Standing at 48 ft tall it is said to be one of the tallest in the bitterroot valley. The barn is made with timber logged right off the ranch it is located on. We are 2.2 miles off Highway 93, southwest of Victor, Montana. If you have ever been to Western Montana, and the Bitterroot Valley in particular, you will truly understand the basis for a business such as ours. While the area is one of the most spectacular settings for its residents, with beautiful mountains, lush green valleys, and a blue-ribbon river that attracts fishermen from all over the world, the economic conditions is less then lucrative. People have to choose to live here first and then determine where they can carve a niche to provide money to survive. Bitterroot Evergreens epitomizes the self reliance of those us who have chosen to call Montana our home. Long hours, hard work, and utilization of natural resources pretty well sums up the way our business operates. Bitterroot Evergreens was stared in 1955 as a small family business, and has remained just that way through the present. The business has changed owners three times but still continues to produce wreaths, centerpieces, and swags with the same superb quality and freshness. Though we have tried to improve in some areas, such as adding a boxed assortment of evergreens, berries and cones for the “do it yourself” individual, we make our wreaths essentially the same as you would have purchased in 1955. We hope you enjoy your wreath, centerpiece or swag from us.